Our guided walk through Assisi – justly acclaimed “crown jewel of the medieval hill towns” – encompasses its rich historical and artistic heritage. Not only: as the only American authorized Guida Regionale dell’Umbria, I’ll be pointing out the treasures of Assisi (of all our region of Umbria, of Italy!) that have fascinated me (as a “non-Italian”) and will fascinate you, too. Our tour starts in the stunning 3-level Romanesque/Gothic Basilica di San Francesco built in the 13th c. to house the body of St. Francis of Assisi, patron saint of Italy and most beloved of all saints for the Italians. The greatest fresco masters of the late 13th-c. and early 14th-c. – Cimabue, Giotto, Simone Martini, Pietro Lorenzetti – were called to this Basilica to fresco Francesco, rendering this church one of Italy’s most outstanding art museums. A 13th c. historian wrote: “no more exquisite monument to the Lord has yet been built”: nothing has changed. While in the Basilica with me, you’ll learn all about the astounding fresco restoration project following the earthquake of 1997, considered among the greatest restoration projects in Western European art. I’ll show you the very spot where modern art was born (in 1300) and point out many artistic treasures you could miss. On October 4th, Feast of St. Francis, the procession in the Saint’s honor concludes here in the wondrous Basilica. As we leave the St. Francis Basilica majesty to walk the backstreets of Assisi, I’ll show you fascinating architectural details you’d probably walk right past – and plenty of “local curiosities”! As we stroll, keep your eyes out for the many edicole in our town and look over the doors and windows for the “Pax et bonum” tiles. And you’d probably walk right past the 3rd BC Roman wall and Roman city gate I’ll show you near the Basilica di Santa Chiara (stunning 13th-c Gothic church). Learn about the treasures of the Basilica (those to note, those you could miss) before we head to the main piazza of Assisi. All the history of Assisi and every architectural style is synthesized here. (In May, this main square backdrops one Italy’s greatest medieval festivals, our Calendimaggio)! Piazza del Comune is the perfect place to conclude an Assisi stroll. Anything missing? Just ask! If you wish to meet “the locals”, see the work of local artisans – engravers, painters, scupltors, maiolica craftsmen, book-binder/restorer, a glass-painter, weaver, carver of olive wood – I know where they are; after all, Assisi has been my “hometown” since 1975. My aim in any medievalhill town guided visit: to enrich your Italy stay with countless treasured memories and insights. A promise. After a morning in Assisi, eager for another hill town visit? What about Spello for an afternoon guided visit? Not to miss in Assisi: all the wonders! Spello, che bello! Like Assisi, Spello is constructed in the local pink limestone quarried on Mt. Subasio, lending it a unique rosy hue, particularly at sunset. Discover the vestiges of Spello’s Roman origins, one of the most splendid Renaissance fresco cycles in Umbria, and in a nearby church, you’ll want to meet an inspiring local friar/craftsman. Medieval splendors – the great ones, the lesser-known ones – highlight this day. Encounters with unforgettable local people make it a day to remember. Our guided walk of Assisi will encompass its rich historical and artistic heritage as well as contact with the “locals” wherever we wander. (After all, you cannot truly know a place unless you also know its people). In the morning, our Assisi walk takes in the stunning 3-level Romanesque/Gothic Basilica di San Francesco built in the 13th c. to house the body of St. Francis of Assisi, patron saint of Italy and most beloved of all saints for the Italians. The greatest masters of the time – Cimabue, Giotto, Simone Martini, Pietro Lorenzetti – were called here to fresco the Basilica di San Francesco, rendering this church one of Italy’s most outstanding art museums. In the words of a 13th c. historian: “no more exquisite monument to the Lord has yet been built” (- and this comment is still appropriate!). Here in the St. Francis Basilica – arguably, the greatest art museum in Italy between Rome and Florence – I’ll show you many artistic treasure you’d probably overlook. And did you know that here in the Basilica you can see where modern art was born in 1300? I’ll also show you the frescoes restored following the 1997 earthquake. The restoration project is arguably the greatest restoration project in Western European art – and wait to you hear the story!. (I have lectured on the Assisi earthquake restoration throughout the U.S and cannot wait to share all the news with you!). After our Basilica guided visit, we’ll walk through Assisi’s hidden medieval backstreets and I’ll be sure to point out countless architectural details that you’d probably pass. We’ll find together lovely edicole and pax et bonum tiles (you have to know where to look!) Our stroll leads us past the place where St. Francis renounced his wealth in the 13th-c and on to the majestic Basilica di Santa Chiara, where St. Clare of Assisi, follower of Francis, was buried in the 13th century. And if you’d like to meet local artisans during our walk – bookbinder/restorer, maiolica craftsman, sculptor, olive wood artisan, weaver – please just let me know. 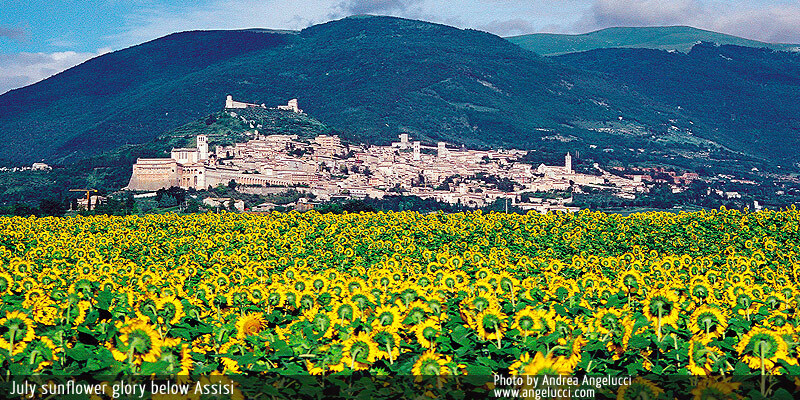 Assisi has been our “hometown” since 1975 and what pleasure to introduce you to “the locals”! Hungry? Past guests have asked about lunch in an Umbrian farmhouse – and I invited them to our home. That experience would certainly enhance your day. But wherever you eat, the afternoon experience will be a perfect conclusion to your Assisi day: we’ll head up the slopes of majestic Mount Subasio to the 15th c. Franciscan monastery, the Hermitage (Eremo delle Carceri), set in hundreds of acres of live oaks and built over the site of the grottoes where Francis and his followers withdrew for periods of prayer and meditation in the early 13th-century. A perfect end to our memorable day. Anything missing? Please just ask! My aim in any Umbrian hill town guided visit: to enrich your Italy stay with countless treasured memories and insights. A promise.